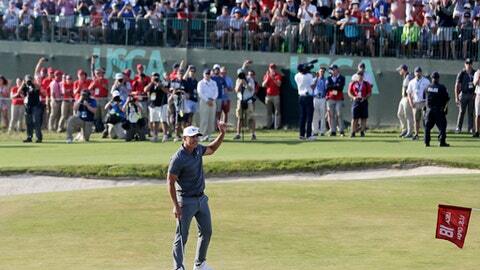 SOUTHAMPTON, N.Y. (AP) Brooks Koepka has the game to win a U.S. Open on any course. No one took advantage like Tommy Fleetwood, who made eight birdies – none of the two par 5s – and became the sixth player to shoot 63 in the U.S. Open. That got him within one shot of Koepka, who still had 11 holes to play. Fleetwood had to settle for the silver medal. Koepka, with a performance and a demeanor reminiscent of Retief Goosen winning at Shinnecock Hills in 2004, began the back nine with three pivotal putts – one for birdie, one for bogey, one for par. GRAND RAPIDS, Mich. (AP) – So Yeon Ryu won the Meijer LPGA Classic for her first victory of the season and sixth overall, closing with a 5-under 67 for a two-stroke margin.